What a delicious day! This place, I will start off saying, is beyond fabulous. There is more potential here, more latent beauty, more intelligence and thoughtfulness, more passion than anywhere I have seen at any time. It is a stunner… We left early for the airport and picked up my colleagues. They had an hour ordeal, nothing like ours, and then we left immediately for Finca Vigia which is Hemingway’s house that he shared with Martha Gelhorn. I have known about this house forever and have seen photos – this is the house where he wrote Old Man and The Sea – and the Pilar, his boat, is still here. It is a lovely house and all of his books, typewriter, animal heads (think Green Hills of Africa) his Spanish bullfight posters are left as they were when he was in residence. What a moving morning. We made a quick stop at the Hotel Nacional (where I had met Fidel when I was 6) to have a class in Mojito making – hardly difficult to make and even easier to drink but it was just an excuse to see this massive and very beautiful hotel that desperately needs reno. Today it is filled with the film festival folks..again, I saw Ethan Hawke and deNiro is here as well. The place was crawling with people and film crews taping and interviewing. Kind of fun. Lunchtime took us to a paladar called HM7, a very cool and sophisticated restaurant, privately owned, but with a chef’s table. It was good..lobster and octopus and fancy caesar salad in a parmesan bowl. The only restaurant like it in the city. The afternoon return to the hotel was early to check in the newbies. And then at 5PM Jose Raul Linares and his wife, Cecilia, came to the hotel to give us a talk on Cuba – US relations up to the present time. Jose Raul must be in his late 70s, and is in a wheel chair having lost his foot. He was deputy minister of the interior under Fidel – a charming man of great erudition. We moved to a side room in the hotel and he had a visual presentation alongside which he talked easily. The points he stressed were that our mutual ties stretch way back over the centuries and that our closeness has waxed and waned over time but has always existed. The evidence of these ties are all around us in Cuba – a botanic garden that Harvard planted on the east of the island, whole towns built up around sugar plantations, again on the east, (two of them called Boston and Preston), Quaker, Episcopalian and Protestant communities, and so much more. He spoke of the psychological and political vacuum that exists in Cuba today, about a crisis of morale, about the use of linguistics to shape the experience of a people, about the twin threats facing the island which are ones of currency and the the growth of economic inequality..the first will manifest itself in the deletion of one of the two currencies it holds (it has the peso which is 30:1$ and the CUC which is 1:1$ and which will probably be dismantled) and the ration book which was instituted decades ago to ensure that every citizen received a full “basket” of produce so that no one went hungry..this ration book will no longer be given to everyone and the question will be who will continue to receive the ration book and the free basket of food. Both will have severe consequences. We ended late..he spoke very sweetly about me in front of the others, having read my PURE interview on line (he did his homework!) and he repeated almost verbatim some of the things I have said about travel, applying them to his own country’s need to open up the dialogue. It was quite moving to me when he equated my PURE story of the US travel embargo on Vietnam with our travel embargo on Cuba and when he congratulated me for believing that travel has the possibility of changing lives, of opening minds and hearts. He liked the fact that I said that travel should be a requirement and not a privilege. 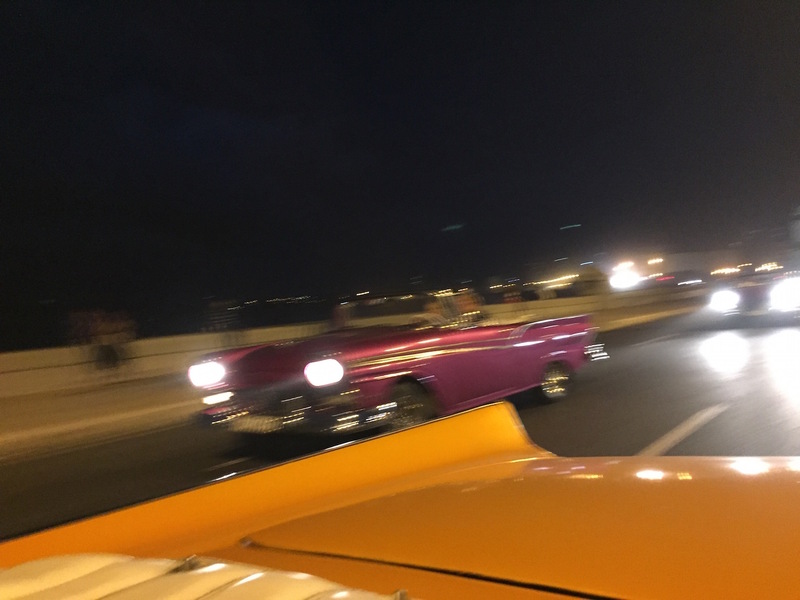 And then we went off in our classic cars – fabulous bubble gum pink 56 chevy convertible, with a cat call horn and, in three of them, we speeded down the Malecon with waves crashing over the wall..one of the coolest things I have done. How glamorous these cars are and they make you feel so glamorous just being in them – probably like cruising the Venice canals in Clooney’s Riva! We were headed to the house in Miramar of an artist called Kodir Lopes-Nieves, a 42-year old established artist who takes old industrial and other business signs (think coke, Shell, Esso), paints images over them that he perceives have some kind of connection (for example he collaged a photo of 1950 gamblers around a casino table over a Wells Fargo sign). He also has revived the art of neon and has the one neon light maker in Cuba repairing and redoing neon signs for restaurants and businesses which, on his own penny, he is putting back up on the correct buildings throughout the city even if there is no longer any business in the space. 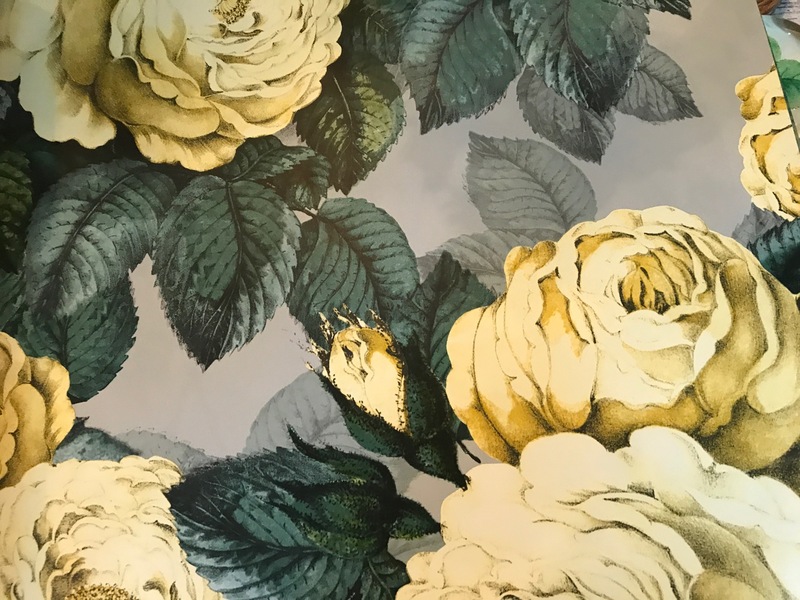 He was really interesting to talk to…he sells in LA and has been to Art Basel, etc., but he finds huge inspiration right here and, as with everyone I have met, he is articulate, realistic, and passionate about his home. And then dinner in another paladar where food was served family style..the city is busy busy so service was quite slow and the restaurant completely full. The rain poured down outside, the lightening cracked and we had a good time. Food was not memorable..more lobster, plantains, black beans..but all seemed to enjoy it.